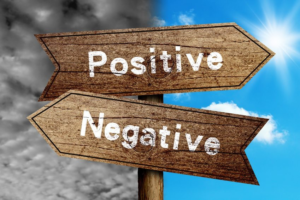 Do you find yourself too often getting bogged down in negatives? Processing and dealing with negatives on the news, at home, and in the office zap energy and focus. Need help with re-gaining a positive mindset? Suggestion: Set up two columns on a sheet of paper. On one column, list the negatives and challenges you have faced and dealt with in the past year. Then, cross off the ones that are no longer issues or are totally beyond your control. Next, list on the second column the positives that happened in the past year. Cross off any that did not help you to move your business forward. Now take at look at both columns. My guess is that there are more positives than negatives listed and that the majority of negatives were crossed off as now being irrelevant while the majority of positives are still relevant to the success of your business. We spend far too much time and energy in wringing our hands over the negatives instead of recognizing and applauding the positives! Let go of holding on to the negatives and, instead, embrace the positives.